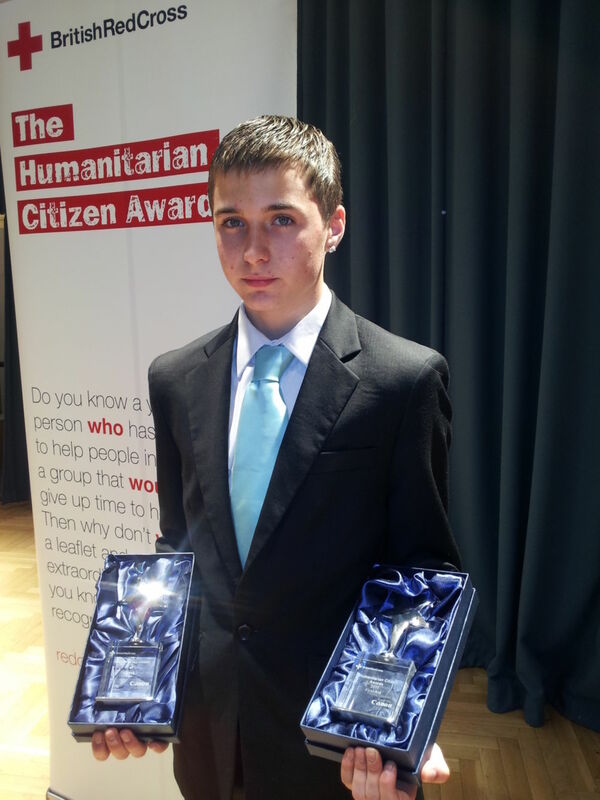 Congratulations to Jacob Rice of Essex Army Cadet Force who was named Humanitarian Citizen 2011 by the British Red Cross at a ceremony in London on Saturday 8 October. Jacob was one of four Army Cadets being honoured at this prestigious event for using their first aid skills in real life emergencies. Last year Jacob and his friend Stephen were riding their BMX bikes in a local car park when Stephen fell off his bike and hit his head on a kerbstone, resulting in a five-inch gash from the top of his head down his forehead, that caused serious loss of blood. Remembering his first aid training from the cadets, Jacob gave immediate assistance to stem the bleeding by applying pressure to the wound. He called on passers-by for help, located a mobile phone and called 999 giving the emergency services accurate information about their location and his friend’s injuries. Jacob remained calm and kept control of the situation, maintaining pressure on the wound until the ambulance arrived. Stephen required 54 stitches to the wound and has also had plastic surgery. Jacob Rice, Essex Army Cadet Force, for helping his friend after a serious cycling accident. Dale Thomson, 2nd Battalion The Highlanders Army Cadet Force, for going to the assistance of a semi-conscious man lying in the street with a head injury. Augustina Eburay-Anteson, Middlesex and North West London Sector Army Cadet Force, for assisting a girl at school after a fall and also helping with a choking incident on a bus. Michael Brown, Sussex Army Cadet Force, for managing the aftermath of a motorcycle accident. 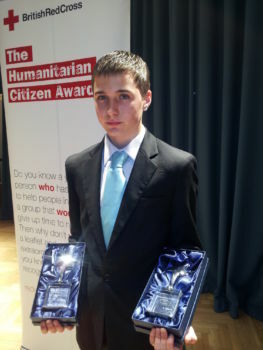 Jacob was presented with a trophy as winner of the first aid category, and then a second trophy as overall winner of Humanitarian Citizen 2011. He also received a digital camera and printed and two tickets to a match at Fulham FC.